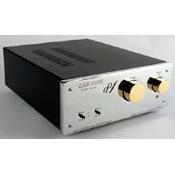 Switchable moving magnet/moving coil phono preamplifier. Volume control allows direct connection to power amplifier. A buffer stage follows the volume control, using an output transformer which provides balanced or single-ended output at low impedance to drive long cables. Two inputs, one with switchable gain and input impedance (internal). Mono/stereo switch.